Every driver knows what it’s like to squirm in your seat, trying to arch your back into the right position, fiddling with the seat to try and get the right balance. But did you know that just by keeping the right kind of seat cushion in your car, you could alleviate many of the problems associated with long-distance drives? The right product with the right dimensions can work wonders for muscle and back aches. Many are designed orthopedically, with human ergonomics in mind. Some come in a tapering wedge shape, while some come with contours grooved into their structure to accommodate the shape of your body. While every itemreviewed here has been selected for functionality and value, some are designed with different users in mind. When choosing a seat you must consider the features most important to you. Some are suited to bucket seats, while some aren’t. Some use memory foam, while others use natural materials in their construction. That’s why we’ve put together his handy review – to break down everything you need to know about what you’re buying, before you buy it. So read ahead, and take advantage of our in-depth research which will save you time from clicking through dozens of manufacturer pages and websites. This lightweight, portable option is rear-loaded with a U-shaped, contoured design which functions to distribute your weight where it needs to go. It helps straighten out your spine during long periods of sitting and works to promote healthy posture by relieving the stress on your tailbone. With a generous 3-inch thickness and a plush, velvet fabric cover, this product from Aylio is the top choice for luxurious and effective back support. On most sitting surfaces your tailbone takes all the pressure and causes your spine to bend forward. This option, however, has a small cut-out at the back so that your tailbone never has to come into contact with the surface. Instead, it floats above the surface of the pad and allows your spine to remain straight. The product's 3-inches of thickness don’t make it cumbersome - the overall weight is only 1-pound. The dimensions of 18 x 14 x 3 inches make it just about the same width as an aeroplane seat. The Aylio Coccyx is a very popular item online and has a wealth of reviews testifying to its value. While not a budget buy for short term use, it is still available at a very affordable price. This product uses 100% pure memory foam in its construction, and is subject to rigorous research testing by its manufacturers. It follows the U-shape construction to provide tailbone relief, and is marketed as a possible solution to nerve pain. Suitable for anyone from 100-300lbs, the dimensions are 17.5 x 13.5 x 2.8 inches, and its cover is machine washable. The product has a weight of 1.9lbs. To combat the common problem of the pad slipping out from from under you while driving, this model comes equipped with small rubber studs which create some friction between the surfaces and keep the seat under you, where it’s supposed to be. The memory foam used in the pad is the same kind you’d find in modern memory foam beds. The foam provides support and stability while at the same time retaining, or remembering, its density. This product comes at an easily attainable price and provides a lot of bang for its buck. The non-slip rubber studs add value on their own, although the pad is not quite as thick as others, and packs a heavier weight too. Also comes with a lifetime return policy. 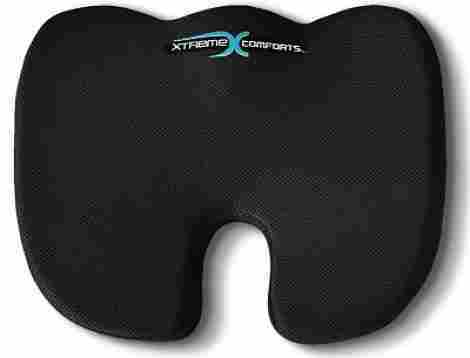 This Coccyx model from Xtreme Comforts provides all of the functions of a supportive seat pad, while offering generous thickness levels and a breathable mesh cover. 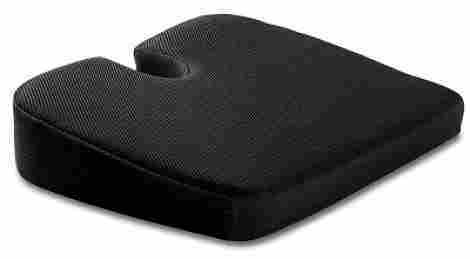 The seat uses memory foam at a thickness of 3.1-inches, and has rubber studs on the bottom to stop it from slipping. 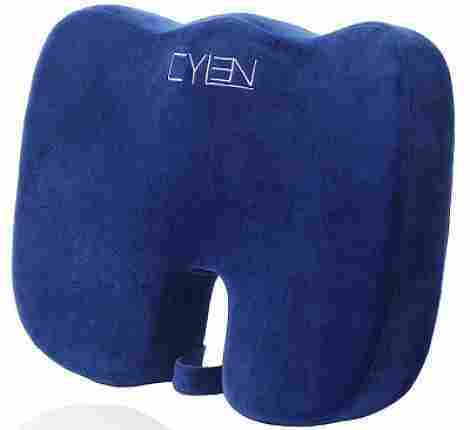 This product employs the coccyx, U-shaped design and provides good back support and tailbone relief. This kind of offer not only acts as a vouch of confidence from the manufacturers, but helps take the sting out of a potential purchase that you may not be too sure about to begin with. The company claim their memory foam product will never go flat. While this may be a bit hopeful, it’s certainly true that memory foam has a much longer shelf-life compared to other materials. Coming in at a relatively low price, this option from Xtreme Comforts is available at two different thickness levels - original and luxury. The luxury model is around half an inch thicker, and is priced slightly higher. Overall, good value for the functions it performs. This product utilizes the hybrid materials of both memory foam and cooling gel, in an effort to maximize back support and comfort. The gel layer absorbs and dissipates heat away from the driver, and helps stop the heat build-up often associated with this type of product. The velour cover provides a lush feel, while also being zippable and washable. This kind of gel technology is normally associated with luxury memory-foam beds. Here we find it employed in the ComfiLife product to help keep drivers cool on the road. The gel works to negate heat build up, and combines with the memory foam to create a supportive surface. With a length of almost 18-inches, carrying the product around with you could have been a bit of a pain in itself. Fortunately, it comes with an integrated handle to make transporting it a non-issue. The item comes with a money-back guarantee, although you should check the small-print on the manufacturer’s page. Overall, this model provides great value for its price, and sets itself apart from the pack with its combo of memory foam and cooling gel. This product from CYLEN is infused with bamboo charcoal to provide aeration throughout the structure of the seat, and allow excess heat build up to circulate and dissipate. The memory foam material is responsive to temperature, and will be harder in cold conditions and more pliable when it’s warmer. Also comes with a manufacturer stamp of confidence in the 5-year warranty which comes with any purchase. The subtle bamboo charcoal infusion used in the this product's construction is a natural absorber of smells and odours, while also being porous enough to allow for maximum air circulation. Very useful in eliminating body odour. With a total thickness of 3.8-inches, this cushion is one of the most substantial on this list. Thickness can be sticky issue, as many don’t see the utility in an extra thick pad. But for heavier drivers, this cushion may be ideal. The 5-year warranty adds some security to the purchase, while returns are free for the first 30 days. This option is one of the thickest on this list, and yet also one of the cheapest, and provides excellent value for money. 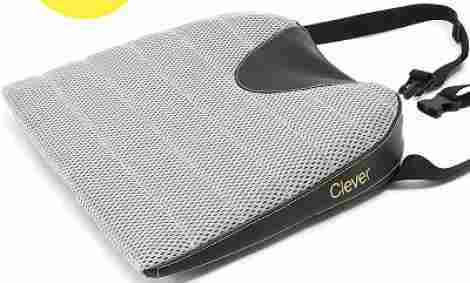 This product from Clever Yellow uses a triple layer design to provide max support while avoiding flattening problems. With three separate foam layers providing support and friction for each other, the overall shelf-life of the pad is greatly lengthened. This item uses a wedge structure while also employing the coccyx design of including a gap cut out for your tailbone. The breathable, ventilated mesh cover encases a supportive memory foam core which is itself topped off by another thin layer of super-dense memory foam. These three layers combine to create a durable, sturdy product that won’t flatten upon first contact. The dimensions reach 18 x 15 x 3 inches, making it one of the bigger options on this list. However, due to the light memory foam materials, it comes in at a weight of only 1-pound. The Clever Yellow ships at an average market price and provides good value for its cost. This product can be used in bucket seats, and is compatible with just about any typical car seat. 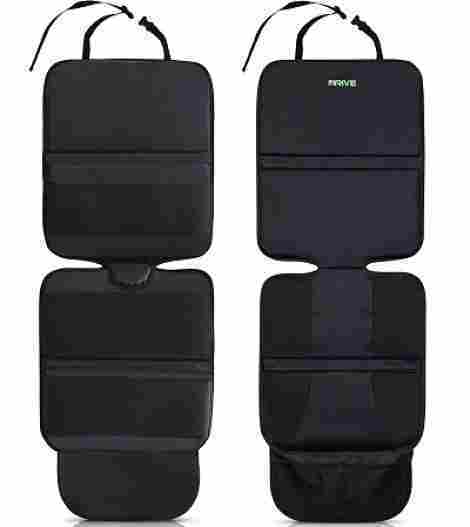 This handy 2-pack from Drive Auto offers softness as well as providing full-seat protection from spills and mess. The total thickness offered by the back and bottom sections equals 4.7-inches, making this more than just a useful seat protector. The product is made from sturdy materials and is held together by strong stitching. A very useful twin-pack that is universally sized for any car seat. This 2-pack is available for the same price as other options on this list. And with similar or comparable thickness levels, this 2-pack is not just a budget deal that can be easily sniffed at. The neoprene material which makes up the covers of this product is a synthetic fabric with a lot of grip, and it works to prevent the item from sliding around underneath you as you drive. With a price equal to single products on this list, this 2-pack cannot be ignored. Even for a single driver, the extra pack would serve handily as a spare, or could even be doubled up for extra thickness. This large option is made from highly durable, furniture-standard memory foam which is rated ‘medium’ in terms of firmness by the manufacturers. The wedge shape is clothed in a 3D ventilative breathable mesh, which is covered in a non-slip silicone coating. The TravelMate also comes with a U-shape gap for coccyx support, and the cover comes with a built-in carry handle. The silicone coating produces enough grip to keep the wedge steady even on a marble floor. The coating is on all sides, so it can be flipped without trouble. The top half inch layer of the wedge is made from responsive memory foam, while the other 2.5-inches consist of furniture grade foam which adds a bit more firmness. At almost half the price of other items on this list, the TravelMate presents an attractive option for that rushed, quick buy. But with dimensions of 17 x 13 x 3, this item is comparable in size to items ranked higher in this list, and taking advantage of its budget price may not be a bad thing. This 2-piece set from Fortem comes with an added back pad for lumbar support. The back cushion is equipped with clippable buckles to allow it to be fastened to your car seat at any height you want it. Meanwhile, the bottom section is ergonomically designed with curves and contours for your buttocks and thighs. Contains orthopedic memory foam and weighs just under 2lbs. 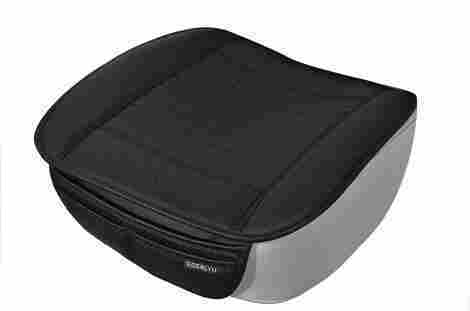 The lumbar support is curved to fit the contours of your lower back. This is a smart piece of tech, since adding a padd to your car seat will change the levels of the seat’s own contours. So adding the lumbar cushion redresses the balance. 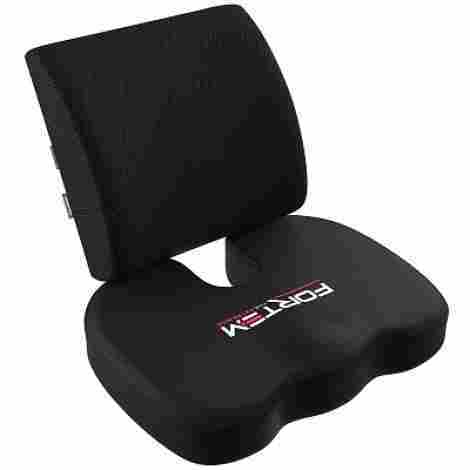 The buckle clips on the lumbar cushion allow it to tied to just about any suitable surface at any height. Besides being good for car drivers, this could also come in handy for motorcyclists. This 2-piece is one of the more expensive items on this list, although still very much attainable. The extra cost is no surprise considering the extra cushion included in the bundle. This simple model from EDEALYN comes with useful attachment options to keep it hooked to the car seat. It also has integrated pockets at the front which hang down over the front of your seat in a non-intrusive way. The thickness of the is lesser than other models mentioned here, although it has its own useful functions besides thickness. The bamboo charcoal used in this seat does add a slightly firmer feel to it, but it also works to absorb odours and regulate temperature due to its porous, aerated nature. If you’re still lighting up in the car, or you have passengers who do so, this item provides a bit of relief from the possible dangers by being made from a fireproof material. This EDEALYN model ships for a very modest price and it provides good value for its unique features. For buyers looking for a really thick pad, read on. Otherwise, this cushion serves a good function. These products aren’tjust about comfort. When you’re on the road, everything is related to safety in one way or another. Sitting in an uncomfortable position is not good for you in the long run, and could lead to long term issues which may affect your driving. The right seat pad should make you forget it’s there, while providing stability and support while you’re driving. Some are used as height-boosters for smaller drivers, while some users want supplementary softness to what they’re car seat naturally provides. Some drivers simply need something to help prop their back up while driving. Either way, this review contains enough choice and variety for the even the most discerning driver, and the items listed here should provide safety and stability to any driver, regardless of their needs. The products reviewed in this list represent the best the current market has to offer. Before a product can make it onto this list, it has to satisfy a number of criteria. These criteria add up to create a high standard which the products much reach before they can be recommended in good conscience. So continue reading and find out the most important things to consider when judging a good car seat pad. These items are made to fit the dimensions of a typical car seat, without hanging over the edges or scrunching up in the middle. This is particularly important since even a slight over-shot in size could affect your ability to reach the handbrake or seatbelt clips. Everyone will have their own preferences when it comes to the overall size. That’s why this review contains a variety of items of different sizes and shapes. The lengths can range from around 16 – 18 inches. The width (front to back) falls around 13 – 15 inches. The thickness ranges from around 2.3 – 3.8 inches. At this size-range these items are fit for any car seat. The best products all dip into a pool of the latest materials for use in their construction. Different materials come with different benefits and different downsides. Take a look at our list of materials to look out for when choosing the item that’s right for you. Memory foam burst onto the market with the advent of modern mattresses, but has since found a use in a range of different fields. Here, it’s used in much the same way as it is in a bed – it provides soft, contouring support which adjusts to your body, rather than you adjusting to it. Memory foam takes its name from the way it remembers its initial shape. A good product which uses memory foam in an efficient way won’t just collapse under the weight of occasional use. Just like a mattress, it should expand to its former shape and retain the strength and durability it was constructed with. Some memory foam materials are notorious for the synthetic smell they give off. This is known as off-gassing, and affects some people more than others. None of the items listed here suffer from this problem, but if you are particularly sensitive to smells and want to know more, be sure to check the product page and read customer reviews before buying. The only other relevant downside of memory foam is its tendency to hold onto heat. Given the tightly compacted nature of the foam, this is to be expected, and even the best memory-foam bedding companies suffer from this problem. This can be remedied by choosing an option with a suitable breathable cover. If breathability is your deciding factor, look out for an option with a breathable cover. Mesh covers are the most common in terms of breathable materials, and allow for maximum airflow between the product and the cover. Mesh covers are naturally prone to stains, purely due to the small, tight stitching involved in their manufacture. To combat this issue, you’ll want to look for a mesh cover that’s removable, and preferably machine washable. More on that later. Some products forego synthetic memory foam in favour of natural materials, like bamboo charcoal. Bamboo charcoal is exactly what it sounds like – pieces of charred bamboo, which are ground down to create a soft, malleable, contouring texture. When packed inside a cushion and surrounded by a suitable cover, this makes for an excellent filler. Unlike memory foam, bamboo charcoal doesn’t lose its shape over time – since it has no solid shape to begin with. Also, this is perhaps the best option out there for a material which is breathable, and doesn’t hold onto heat. The bamboo charcoal is porous by its very nature, and allows air to flow through it continually. Any product you use in your car will have to be stable and secure, without sliding out from underneath you while you’re driving. To help keep your pad on your seat, the best options come with various non-slip materials which create friction between the product and the seat. Neoprene (polychloroprene) is a synthetic rubber polymer which provides excellent structural stability and flexibility. It can be washed easily and doesn’t lose its shape over time. These products can benefit from neoprene by its use as a non-slip coating. Some options have neoprene studs tacked onto the bottom of the seat while others incorporate neoprene into the materials of its cover – providing all round protection from slipping. Neoprene was invented in the 1930s as a response to rising rubber prices. It was the first synthetic rubber to be invented, and has been used in a range of products and industries ever since. If you’re specifically seeking out environmentally friendly materials, then neoprene may not be the material for you. It requires extensive industrial processes to manufacture, and doesn’t decompose easily. Otherwise, it performs very well as a non-slip additive. Another common non-slip feature is silicone. Normally coming in the form of tiny studs on the bottom, these little protrusions provide just enough friction to keep it firmly in place on your car seat. Silicone benefits from being heat-resistant, so won’t affect the temperature of your product. Some products ignore non-slip materials all together and instead use cords which can be tied onto the car seat itself. Some come with back-pieces which are tied behind your back at whatever height you find comfortable. Others come with discreet fasteners which tuck into the gap between the backrest and the seat. This solution provides great stability, along with the option to position it wherever you need it to be. The downside is that you’ll need to reset it if you decide to use it in a different car, or different seat. Also, certain vehicles won’t be suited for this type – such as trucks which use bench seats, since there will be no backrest to tie it onto. This one’s simple enough. Most are equipped with zippable, removable covers which can be whipped off and thrown directly in the washer. If a productdoesn’t have a removable cover, you should be wary of washing the whole thing. If it’s made of memory foam, you’ll end up with a wet sponge that will take days or weeks to dry out, and will eventually start to mould and smell. If the cover of the item is made from an easily washed synthetic fabric, then there’s no need to wash it in a machine. Instead, just use a wet-wipe or cloth to clean the cover. The shape plays a big role in its performance, and can be the difference between having one that helps your back, or hurts your back. Some are designed with orthopedics as a priority. These seats come in a contoured shape which aligns with your buttocks, hips and thighs. A common feature among modern options is a coccyx design. The coccyx is the anatomical name for the tailbone. 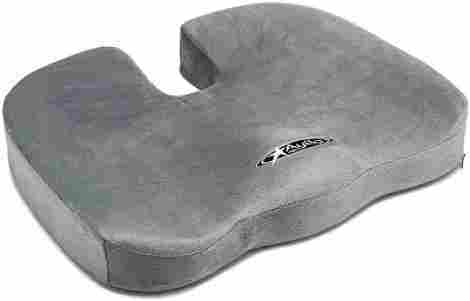 Coccyx cushions come with a U-shaped hole cut out in the back, which provides space for your tailbone to float above the surface of the seat. This removes pressure from your tailbone, and can help with serious back issues. The downside of orthopedic products is that their shape may interfere with the already contoured shape of your car seat, or bucket seat. In such circumstances, a more neutrally shaped option may be appropriate. Nobody wants a pancake. Every product considered meets the maximum range of thickness in the market. Even the thinnest product listed in this review is still several inches thick. In fact, the only criticism that certain options from this list get is that they’re too thick. If you’re particularly large, or particularly small, thickness will be a factor you’ll want to take into close consideration. The selection listed here range from 2.3 inches to 3.8 inches in thickness. As covered in the materials section, certain materials provide better ventilation and breathability than others. If you require dedicated ventilation, look out for bamboo charcoal, mesh covers and other breathable or natural materials. Let’s face it; the item is already being used in the car so transporting it shouldn’t be an issue. But if you’re a commercial driver who takes yours from car to car, then having an easily transported pad would make things much easier. Likewise, if you’re taking it from your car onto your airplane journey, you want to know you can haul it though a busy check-in terminal without too much trouble. Some come with handles fitted onto their covers to allow for portability. These are especially good for larger ones which would be awkward to carry under your arm or in a bag. Items are chosen at different weights to suit different drivers. Some drivers will greatly prefer a lightweight model, while others will want to feel some bulk beneath them. Products reviewed on this list come in at weights between 1-4lbs. It’s not always the case that the larger items are heavier. Weight depends largely on the materials used, rather than the size of them. Q: Does it fit bucket seats? That depends on the shape of the product in question. Most are compatible with bucket seats up to a point, since they are fairly malleable. However, the contoured shape of certain seats makes them more awkward for use in a bucket seat. If your seat already has contours inherent to its design, then adding another contoured layer could confuse things. The chances that a contoured pad will align perfectly with the contours of a bucket seat are quite unlikely. For bucket seat users, it is recommended that you opt for a non-contoured product – like a wedge-shaped one. Otherwise, double-check the product page for more info on its suitability for bucket seats. Q: Will it fit bench seats in a truck? Some will be just fine with bench seats, as long as they have some kind of non-slip bottom. Since bench seats are flat, without contours, you need one which won’t slip and slide underneath you as you drive. Options which come with ties for secure fitting may be useful to you; however certain features will not be compatible with bench seats. Those with a back-plate which ties around your seat-back will be of no use with a bench seat. Q: Is it suitable for someone of heavyweight? Any will display more sinkage if heavier weights are put on it. Many do come with a specific weight range which can be checked on the product page. Products reviewed on this list are suitable for weight ranges up to around 300lbs. Some also come with a minimum weight recommendation, falling as low as around 120lbs. Ultimately, these are only recommendations, and many will find the weight ranges to be somewhat arbitrary. Some come with no weight limit whatsoever. If you’re worried about how your weight will affect the item, you should target products with the highest thickness levels as these will provide the most support. Q: Is it affected by temperature? Depending on the material used, ambient temperature may affect the performance of the pad. Memory foam has a tendency to soften and expand in warm conditions, while hardening slightly and compacting in the cold. This doesn’t present too much of an issue, since the heat from your body while you’re sitting will naturally produce heat anyway. Even in cold conditions, the memory foam will soon warm up during use, as it adapts to your body’s own temperature. While memory foam is designed to remember and hold its shape, excessive heat will slowly degrade its structural stability over time. Even the best memory foam used in beds will eventually soften and flatten, so unless you are particularly affected by this, it shouldn’t be too much of an issue. Options which use gel in their construction will also react to ambient temperature, although won’t be as affected as memory foam. The gel will ‘stiffen’ in cooler climates, but after a few minutes use your body heat should return it to its proper state. Options which use natural materials like bamboo charcoal are the most protected against radical temperature changes. The naturally porous materials allow for the most air circulation, and don’t trap heat like traditional memory foam. The simple answer is no. These are designed with the dimensions of a car seat in mind. Pads for motorcycle seats follow a different design, and often come with ties and attachments to secure the item to the motorcycle seat. Many of the products in this review do come with anti-slip bottoms, and even ties to secure them to seats, but they are simply not meant for the dimensions of a motorcycle seat. You’d be doing yourself more harm than good by attempting it. Better to just find a dedicated motorcycle seat pad. Q: Can this be used for sciatica/arthritis/injured back? Many drivers start looking for pads specifically because of an underlying muscle/nerve pain which is exacerbated by lengthy spells on the road. Fortunately, these products can help with aches and pains, but there’s no guarantee in terms of which item will solve which problem. The best course of action would be to specify your needs before you make a purchase. Does sitting on a thick pad make you feel better or worse? Do you prefer a flat surface or a contoured one? Is your tailbone receiving the brunt of the pressure? If you can answer these questions you’ll be better informed about what kind of padding you need. As is always the case with medical questions: seek the advice of a medical professional before you take action. A doctor is far more qualified to advise you on this than even the best manufacturer, or online reviewer. Q: How thick are the wedge-shape products at their tapered ends? Most wedge options are tapered at one end, thus providing the wedge shape. Wedge options tend to follow a ratio close to 3:1 in their gradient. This means a pad with 3-inches of thickness will taper down to 1-inch at the sloped end. Most wedge products fall within range of this ratio. Some have a more subtle gradient, while others are more pronounced. Q: Can it help improve posture? Yes. In fact that’s one of the benefits of a good car seat pad, particularly one which is orthopedically designed. The coccyx shaped options are especially good for this, as they account for the shape of your tailbone, and stop you from resting your entire bodyweight on your lower back. Contours for hips and buttocks also allow for better posture, as they position your limbs in a comfortable position which reduces the stress on your back. Q: Can I microwave the product to use it as a heat pad? The answer is no. Many come with metallic zippers on their covers which would likely cause your microwave to explode. Also, heated options use specific materials which are able to hold onto heat over a period of time. These options are not designed with heat retention in mind. In fact, many of them take extra steps to reduce heat build up. The product should be fine to use on top of an already active heat pad. The materials are generally light and breathable enough that you would still feel the warmth of the heat pad even with the item on top of it. Q: Will it raise me up in my seat? There’s a likelihood that you will experience a slight rise in your seating position, depending on your weight. Lighter drivers will experience the biggest height boost, while for heavier drivers the height difference will be fairly minimal. Some drivers buy these specifically because they want a little extra height when driving. On the other hand, some drivers have found the height rise to be too much. If you’re having issues with the height yours raises you to, be sure to move your car seat so that it’s at its lowest position. Many newer cars come with adjustable seat heights and this could help you achieve a more suitable driving position. Otherwise, just make sure to account for your weight before you buy. Most products are accompanied by helpful comments from previous buyers which detail the height-boosting performance, or lack thereof. Q: Can I take it with me and use it outside the car? These items have gained popularity among drivers for obvious reasons, but they can definitely still be used outwith the car. Some even come with nifty little handles to make carrying them around easier. If you’re going from the car to the airport, one of these will work wonders on an airplane seat. The same applies to all kinds of public seating arrangements, such as: bus and train seats, sports stadium seats, waiting rooms, etc. They can also be used around the home. The non-slip coating incorporated in certain options make them ideal for sitting on a hardwood or linoleum floor without having them skid around all over the place. Some people drive to yoga/meditation class with it on their car seat, only to take it with them and use it in class. Not many car accessories can be easily applied in other places. This makes one of these items a useful, multi-functional tool to keep around. Q: Is it suitable for wheelchair users? There is no reason why wheelchair users should not benefit from these. As long as the product fits the dimensions of the wheelchair you should be ok. Just remember to adjust the levels of your foot-pads, and anything else that will be affected by the slight height boost that one of these would give you. Q: Is it suitable for piles/ hemorrhoid sufferers? Don’t confuse the coccyx shaped hole for a medical gap for hemorrhoids. The coccyx gap is for your tailbone and nothing else. People suffering from piles or hemorrhoids would be better off getting a proper medical product designed for that specific purpose. Such itesms are usually inflatable and come in a donut shape.